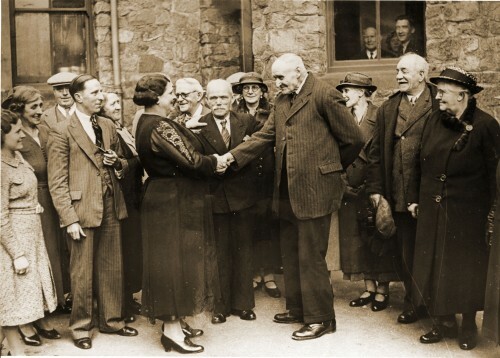 This photograph was taken in about 1935 and shows Mrs Louisa Bumpus from Mansfield Street, who was the secretary of Quorn Old People’s Tea Fund, welcoming Israel Williams (aged 80) to the party. On the left of Mrs Bumpus (holding his pipe), is Jack Martin. He was a popular man and used to organise whist drives and other events in Quorn. To the right of Israel Williams are Frank and Hannah Rue. Frank Rue was the brother of Israel’s wife Frances. In between Mrs Bumpus and Israel Williams is Joseph ‘Warrior’ Burton. He was Quorn’s oldest member of the British Legion and lived at 7 Farnham Street. Born in 1862, he fought in the Zulu War (1879), the Boer War (1899 to 1902), and in 1914, at the age of 52, he joined the Royal Defence Corps. Israel Williams and Joseph Burton both lost sons in the First World War.